Mauritius (pronounced: IPA: [məˈɹɪʃəs]; French: Maurice /mɔʀis/; Mauritian Creole: Moris; Officially the Republic of Mauritius (French: République de Maurice), is an island nation off the coast of Africa in the southwest Indian Ocean, about 900 kilometers (560 mi) east of Madagascar and about 3,943 kilometers (2,450 mi) southwest of India. In addition to the island of Mauritius, the republic includes the islands of St. Brandon, Rodrigues and the Agalega Islands. 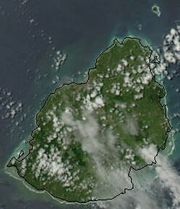 Mauritius is part of the Mascarene Islands, with the French island of Réunion 200 kilometers (125 mi) to the southwest. The flag of Mauritius has red, blue, yellow and green stripes. The red stripe represents the struggle for independence. The blue stripe represents the ocean around the island. The yellow stripe represents the sun and golden light of independence. The green stripe represents fruitful soil and vegetation. Some historians believe that the Phoenicians visited Mauritius as early as 2000 BC. While Arab and Malay sailors knew of Mauritius as early as the 10th century and Portuguese sailors first visited it in 1505, the island remained uninhabited until 1638 when it was colonized by the Dutch. They named the island in honour of Prince Maurice of Nassau. Because of climate changes, cyclones and the deterioration of the settlement, the Dutch abandoned the island some decades later. The French controlled the island during the 18th century and named it Ile de France (Isle of France). Despite winning the famous Battle of Grand-Port, Napoleon's only naval win over the British, the French were defeated by the British in the north of the island, at Cap Malheureux (Cape of the Unlucky Ones) three months later, and thus lost possession to the British in 1810. The latter reverted the island to its former name. In 1965, the United Kingdom split out the Chagos Archipelago from Mauritius to create the British Indian Ocean Territory, in order to utilise the strategic islands for defence purposes in cooperation with the United States. Although the Government of Mauritius agreed to the move at the time, subsequent administrations have laid claim to the islands stating that the divestment was illegal under international law - a claim recognised by the United Nations. Mauritius aims to become the business hub of the Indian Ocean. New business opportunities in banking and the technology sector are being actively sought. Through the celebration of the Bicentenary of the Battle of Grand Port in 2010, Mauritius is aiming at rebuilding its maritime heritage and reclaiming its title of the Star & the Key of the Indian Ocean. The head of state of Mauritius is the President, who is elected for a five-year term by the National Assembly, the unicameral Mauritian parliament. 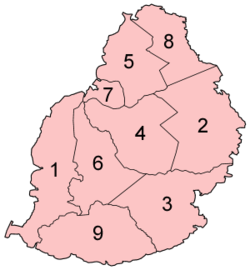 The National Assembly consists of 62 members elected directly by popular vote, with between 4 and 8 further members appointed from "best losers" election candidates to represent ethnic minorities, depending on the results of the election. The government is headed by the prime minister and a council of ministers. The most recent general elections took place on the 3 July 2005 in all the 20 mainland constituencies, as well as the constituency covering the island of Rodrigues. Historically, elections have always adhered to a two-party system in Mauritius and this has also been the case this time, with the outgoing MSM/MMM/PMSD coalition against the PTr-led Alliance Sociale which includes PMXD, Les Verts, MR, MSD and MMSM. The Alliance Sociale coalition won 38 seats and will form the next government with PTr leader Navinchandra Ramgoolam as Prime Minister. The MSM/MMM/PMSD coalition won 22 seats and will form the opposition. The 2 remaining seats for Rodrigues were won by OPR candidates. According to the Constitution, an additional eight seats were allocated to "best losers" to guarantee equitable representation of all ethnic groups. This brought the total representation to 42 Alliance Sociale, 24 MSM/MMM/PMSD, and 4 OPR. In international affairs, Mauritius is part of the Indian Ocean Commission. In 2006, Mauritius asked to be an observing member of Commonwealth of the Portuguese Speaking Countries in order to become closer to those countries. 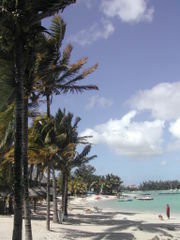 Together with Réunion and Rodrigues, Mauritius is part of the Mascarene Islands. This archipelago was formed in a series of undersea volcanic eruptions, as the African plate drifted over the Réunion hotspot. 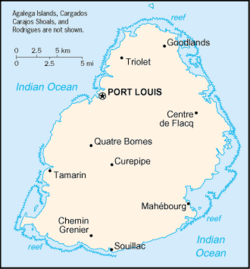 Mauritius and Rodrigues were formed 8-10 million years ago. They are no longer volcanically active, and the hotspot now rests under Réunion. The island of Mauritius itself is formed around a central plateau, with its highest peak in the southwest, Piton de la Petite Rivière Noire at 828 metres (2,717 ft). Around the plateau, the original crater can still be distinguished from several mountains. Port Louis, capital of Mauritius. 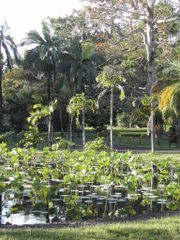 Pamplemousses Botanical Garden, north of Port Louis. Since independence in 1968, Mauritius has developed from a low-income, agriculturally based economy to a middle income diversified economy with growing industrial, financial, and tourist sectors. For most of the period, annual growth has been of the order of 5% to 6%. This has been reflected in increased life expectancy, lowered infant mortality and a much improved infrastructure. Estimated at $16.28 billion for 2005, Mauritius has the 2nd highest GDP per capita in the whole of Africa. It is only exceeded by Equatorial Guinea, which derives most of its revenue from oil exports. Mauritius on the other hand is a very mature economy with a great deal of wealth distribution among its citizens. The economy is mainly dependent on sugarcane plantations, tourism, textiles, and services, but other sectors are rapidly developing as well. Sugar cane is grown on about 90% of the cultivated land area and accounts for 25% of export earnings. However, a record-setting drought severely damaged the sugar crop in 1999. The government's development strategy centres on foreign investment. Mauritius has attracted more than 9,000 offshore entities; many aimed at commerce in India and South Africa while investment in the banking sector alone has reached over USD 1 billion. Economic performance during the period from 2000 through 2004 combined strong economic growth with unemployment at 7.6% in December 2004. France is the country's biggest trading partner, and has close ties with the country. They also provide technical assistance in various forms. On 4 April 2005 during his budget speech , Hon. Pravind Jugnauth, Deputy Prime Minister and Minister of Finance and Economic Development announced that Mauritius will become a duty-free island and that will take about four years. Duty has been decreased (and for many products completely eliminated) for more than 1850 products including clothing, food, jewelry, photographic equipment, audio visual equipment and lighting equipment. A plan by ADB Networks calls for Mauritius to become the first nation to have coast-to-coast wireless internet access. The wireless hot spot currently covers about 60% of the island and is accessible by about 70% of its population. By the end of 2006, antennas should provide access to 90% of the island. Its biggest trading partners are France and the UK. Mauritius ranks first in respect of FDI inflows to India amongst all the countries with cumulative inflows amounting to US $ 10.98 billion. Top sectors attracting FDI inflows from Mauritius (from January 2000 to December, 2005) are electrical equipment, telecommunications, fuels, cement & gypsum products and services sector (financial & non-financial). Mauritian society is highly multicultural. Island residents are the descendants of people from the Indian subcontinent, continental Africa, Madagascar, France, England, China plus a few other places. The official language of Mauritius is English. French dominates the media and business, radio and television, despite France having lost its colonial dominion over the island nearly 200 years ago. The French-derived Mauritian Creole, with influences from the other dialects, is widely spoken (80%) on the island and is considered the lingua franca of the country. French and French creole is used in everyday life. Several other languages, including Arabic, Portuguese, Indian languages such as Urdu, Hindi, Punjabi, Tamil, Telugu, Marathi, Bhojpuri, Gujarati or dialects of Chinese like Cantonese, Hakka and Mandarin are also spoken. The latter South Asian languages are spoken by descendants of the labourers brought from British India during the British rule. The Indo-Mauritians (when the ethnic groups are combined) form approximately 70% of the total population, while the rest of the population is of either African, French, Chinese, or mixed descent. There are approximately 30,000 Mauritians of Chinese descent, from Hakka, Mandarin and Cantonese language groups. More than 90% of the Sino-Mauritian community adhere to the Roman Catholic faith. Of all religiously affiliated Mauritians, Hindus constitute 52%, while the remainder is composed mostly of Christians (28%) and Muslims (16.6%). Buddhists (2.5%), Sikhs (0.3%) and other religions are also followed. 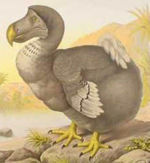 Mauritius was the only known habitat of the extinct Dodo bird. The mixed colonial past of Mauritius is reflected in its culture. For example, the cuisine of Mauritius is a blend of Indian Cuisine, Creole, Chinese and European. It is not uncommon for a combination of cuisines to form part of the same meal. The "cari poule" or chicken curry, for example, is a very popular dish and eaten by all sections of the community. Mauritian Cuisine is a great leveller and brings together all sections of the community. Famous chefs on Mauritian Cuisine come from varied cultural backgrounds. Among the best known for traditional Mauritian Cuisine are Guy Felix, Lalita Sookhee, Philippe Lenoir, Raymond de Ravel, Madeleine Philippe and Zubeida Randera. Madeleine Philippe is well known for her promotion of Mauritian Cuisine on the Internet. Most restaurants are owned by the Sino-Mauritian community, thus it is not surprising that well-known 'chinese' dishes have become Mauritian favourites. The "mine-frit" (Mauritian fried noodles) and "niouk nien" (dumplings) are loved by all and readily bought by the Mauritian community either in restaurants or on the sidewalks of main streets. Moreover, since the food stalls by the streets are mainly owned by the Muslim and Indo-Mauritian communities, the 'Alouda' (a milky drink with basil seeds) has become a typical mauritian drink and the 'dholl puri' is the favourite of all communities. In 1847, Mauritius became the fifth country in the world to issue postage stamps. The two types of stamps issued then, known as the Red Penny and the Blue Penny are probably the most famous stamps in the world, being very rare and therefore also very expensive. Mauritius has from time to time also been chosen as setting for films, most of which are Bollywood productions from India. The latest Hindi film to feature Mauritius has been Garam Masala (2005).